My goodness. 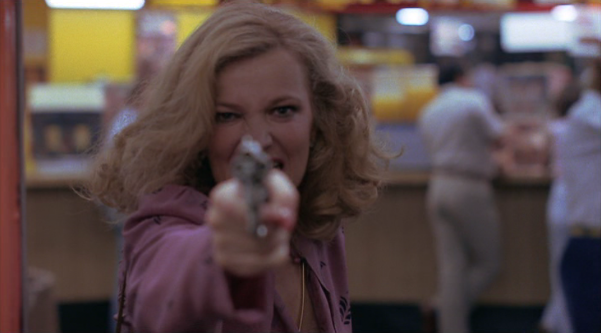 Gena Rowlands chews up the screen and spits it back out in your face. Gloria is no nonsense middle aged broad up in the Bronx. When her neighbors, a mixed race family (headed by Buck Henry) gets wiped out by the mob, she is left with the only survivor, 6 year old boy with wild curly hair, Phil. And she hates kids (especially hates her neighbor's kids, she tells their mother once). Gloria has a shady mob connections from the past and many times throughout the film contemplates ditching the kid. But for some reason, she always ends up shooting her way out with the smartass Phil tightly attached on her waist. On the run, they change series of holdouts, showcasing sleazy NY in the late 70s. In true Cassavetes fashion, the dialog is nonchalant and action immediate. It's all Rowlands though. Not exactly a dog, but she is definitely not a typical Hollywood pretty. Can't see anyone else playing this role.